I believe it’s about the size of the ACT. Helen Amanda Fricker from the Scripps Institution of Oceanography says don’t get too excited, this sort of thing happens naturally. It’s even possible that the ice shelf will re-grow to replace what fell off. While I understand that it is not attributable to climate change as such, and does not in itself increase sea level, I understand the ice has never been this far back during the current interglacial. Climate change will cause ice-free areas on Antarctica to increase by up to a quarter by 2100, threatening the diversity of the unique terrestrial plant and animal life that exists there, according to projections from the first study examining the question in detail. If emissions of greenhouse gasses are not reduced, projected warming and changes in snowfall will cause ice-free areas – which currently make up about 1% of Antarctica and are home to all of the continent’s terrestrial plants and animals – to increase by as much as 17,000 square kilometres. 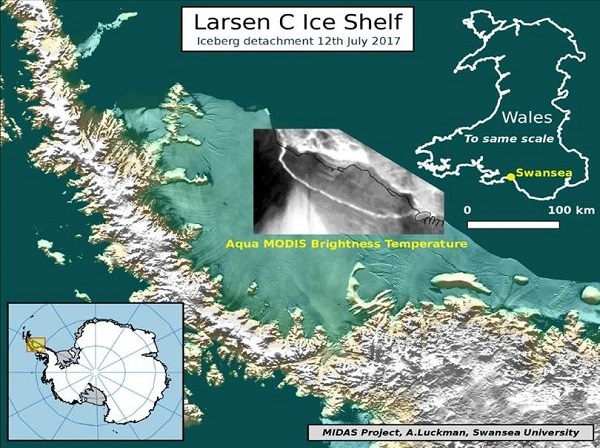 About 85% of the new ice-free areas will emerge in the Antarctic peninsula, which extends out into the Southern Ocean towards Chile, and which has experienced the most rapid warming in the southern hemisphere to date. It is predicted to lose five metres in ice melt by 2100. As CO2 levels increase, the eastern part of the Pacific Ocean warms up faster than the western region of the Atlantic does, resulting in stronger trade winds across Central America. That means more moisture is carried out of the Atlantic, leaving the surface water saltier and denser, and speeding up the “conveyor belt” motion of the Atlantic Ocean. This strong current carries warmer waters north, and as a result leads to increased temperatures. Inversely, the slowing down of this current at other times has been linked to the beginning of ice ages. Relatively small changes in CO2 can trigger a chain reaction. Whether this will happen to us is unknown, because the framework conditions today differ from those in the ice age. It could, we just don’t know. 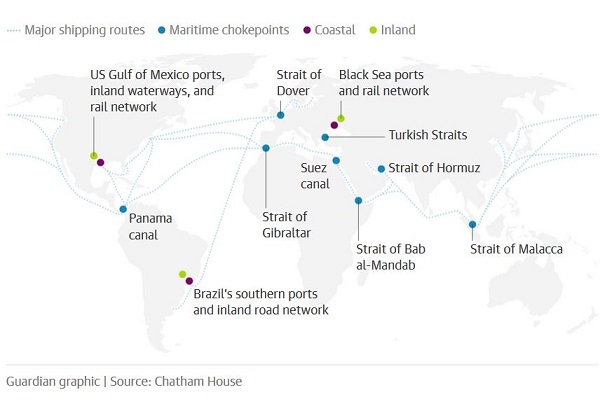 A group of prominent experts wrote an open letter in Nature leading up to the G20 meeting in Hamburg on 7-8 July warning that emissions must be brought down immediately, we can’t wait three years. That was Hans Joachim Schellnhuber, director of the Potsdam Institute for Climate Impact Research, who has been advising German chancellor Angela Merkel directly. He’s not as public as James Hansen, but has a similar appreciation of the fix we are in with climate change. These include increasing renewable energy to 30% of electricity use; plans from leading cities and states to decarbonise by 2050; 15% of new vehicles sold to be electric; and reforms to land use, agriculture, heavy industry and the finance sector, to encourage green growth. They had to work around Trump, of course, but the pollies have been warned. Climate scientist Stefan Rahmstorf cancelled his subscription to the New York Times after they hired climate sceptic Bret Stephens as a columnist. The NYT was promoting the notion that “The truth is more important now than ever”, but had hired a bloke who is ignorant, promulgates falsehoods and denigrates climate scientists. The NYT has countered criticism by saying that “millions agree with Stephens” and denounced the critics of its decision as “left-leaning”. 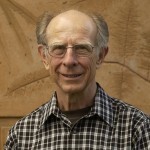 Rahmstorf works for the Potsdam Institute for Climate Impacts Research under Schellnhuber, I think trained originally in quantum physics and has a long record of achievement in climate science. He’s one who has been working on the cool blob in the Atlantic Ocean near Greenland. As predicted, 2017 looks like being a little less warm than 2016, not being an El Niño year. 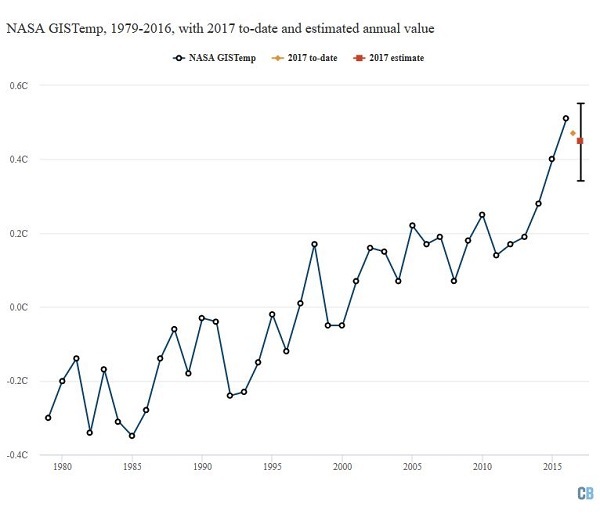 Little comfort can be taken, however, because it looks like being the second hottest year on record. 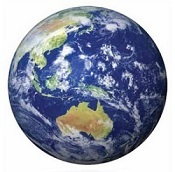 Closer to home Australia records hottest July on record. many may be surprised at that, as it has been fairly cold by all reports in southern parts. It’s a big continent, however, and hear in SEQ we’ve been having day after day of warm spring-like weather, with coolish nights. I’ve become aware that there is an issue with the averages. We are told the temperature is “x” degrees above average, but almost never told what the average is based on. When I got my first computer in 1997 I printed off the BOM averages for the Brisbane Regional Office, which I believe was in Wickham Terrace near the city at the time. It said the last record was 1994 and the average was based on the last 99 years. When I look up the Brisbane averages now, they are quoting the Airport with 1994-2017 as the base. Remarkably they are near as dammit the same. Of course the Airport is not next to the CBD and is closer to the sea. However, the BOM says that Brisbane in July was an average max of 22.8°C, the second warmest on record, presumably against the 20.9°C average on their site. Turning to the Courier Mail, the story was that Brisbane recorded 23.9°C, against an average of 22.9°C. That last figure is what the ABC has been quoting as the average on TV. So beware of averages, but you can bet that whatever is quoted is not the pre-industrial temperature. The latest on Larsen C iceberg. It has broken some smaller chips off, and is gradually pulling away. 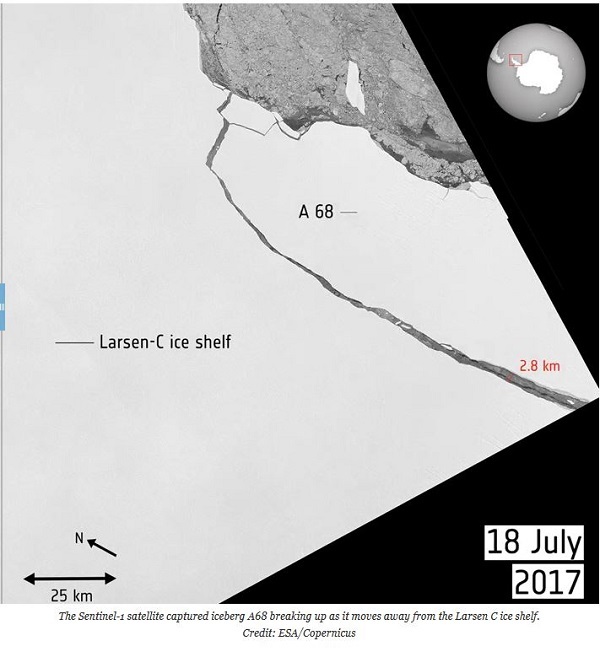 Larsen C has been reduced by 12%. The thing is 200 metres thick, 90% of which is below water, so it may become grounded. 5. I have long pointed to the risk from climate change affecting key industries, albeit randomly, and disrupting key technology suppliers such as electronic component manufacturers. Climate change makes our lives vulnerable in many ways and it is important to think through strategies that require low tech as backups. For instance, one of the most stable components is solar PV panels, but where they require inverters there is a vulnerability when those parts fail. The backup is the good old fashioned motor/generator to convert the DC power from the panels into other voltages and to charge low tech lead acid batteries. Brian when looking at temperature and averages, there are a range of things to consider. The actual temperature number is not the only consideration. Two other factors are humidity and temperature profile over 24 hours. Heat build up is not so much an increase in the temperature level but the duration of the temperature level, particularly in the night time temperature profile. Temperature generally cycles through the day from cold in the morning to heating to very hot in the late morning and through the afternoon then to a late cool off in the late evening towards a very large temperature drop off in the early morning . It is the early morning temperature drop off that is most affected by general warming. What we are experiencing is the temperature sustaining through the early morning to the extent that as the sun rises the air is already still partially warm from the previous day and the mid morning warms rapidly, although the maximum day time temperature is the same, or even lower as average humidity increases. This is the feature that denialists on the Nova like websites refuse to understand. The other factor is humidity. Humidity has the effect of suppressing temperature fluctuations even though the energy content of the air is considerably higher than in dry air. So when talking about temperature maximums the humidity of the air must be considered as dry air will present with higher actual temperatures even though the energy content of the air is considerably less. In short a heating environment is less about the actual temperature level and more about the energy content of the air mass over time. The process of flushing heat out of the air requires humidity which, as moist air is lighter than dry air, rises carrying the moisture to an altitude of lower air pressure and temperature where the latent heat of the moisture is transferred to the air as the moisture condenses to become water leaving the relatively warmer lighter air to continue to rise as the condensed moisture returns to the surface as rain hail or snow, while the heat in the air is transported to the upper atmosphere where it can escape to space. Climate change is all about the changes that occur as this process is increased with increased moisture uptake into the air mass mostly from heating ocean surfaces and drying out land masses. The principle driving mechanism of Climate Change is the fact that moist air is lighter than dry air. More moisture, more energy in the air flow, more overturning circulation, more impact on man and his structures through air pressure and deluge pressure. Its that simple. I’m not reporting actual science here but my observations, deductions and understandings. I’m happy to be corrected if wrong. BilB, I don’t know enough to check what you wrote thoroughly, but it doesn’t conflict with anything I know. My understanding of the science is that the minimums are rising faster than the maximums. When the talk about global surface temperature, I think they mean the 24-hour mean at 1.5 metres about the ground (or sea). I understand that with 100% humidity humans start dying when the temp gets above 35C. There was an article recently suggesting that this will become a problem increasingly in parts of Asia this century. I don’t have the tables in front of me, but the rainfall figures for Brisbane in the years 1994-2017 we markedly different from the 99 years to 1994. The yearly mean was down to 1048mm from 1046. January, the wettest month, was down to 136mm from 159. Summer was down generally, but May was up, and higher than April, reflecting three, I think, of huge downpours we’ve had in May, amongst a pattern of drying autumn weather. Subjectively I think our summers, February in particular, have become less humid. I can only guess what is going on, but I think it has to do with systems moving south. Systems moving south indeed, and increasing in size. moving south, hence picking up less moisture over seas and oceans?